Like most kids, I hated eating vegetables. Although my mom would usually make me eat them, she always had to keep potatoes on standby, if, despite all her efforts, I refused to eat. I have now started eating my vegetables regularly but the potato still remains my favourite and is my go to thing when I just cannot think of what to make. 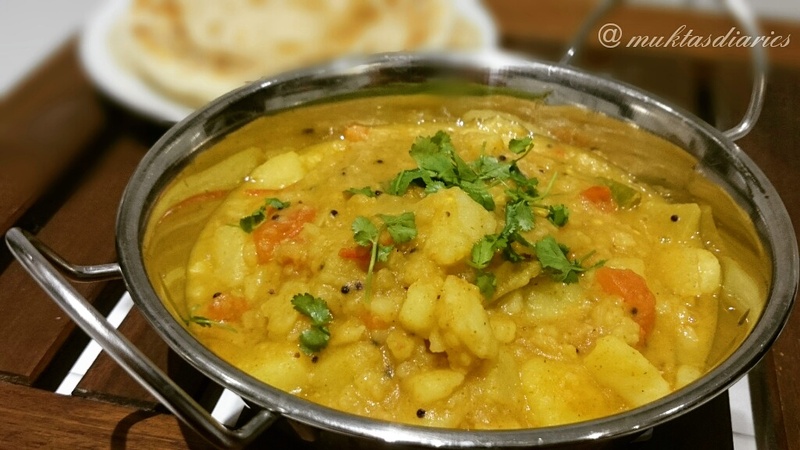 I like making a potato curry because it is simple, can be eaten with bread and you don't have to go through the hassle of making chapati or rice. This curry is similar to how my mom makes it and is an absolute favourite. Heat the oil on medium heat. Add the mustard seeds and let them sputter. Then add in the curry leaves and green chillies. Reduce the heat and add the ginger, turmeric powder and aesofoetida. Add the onion, mix well and cook for 3-4 minutes. Add a tbsp of water if it gets dry. Add the tomatoes and cook for a couple of minutes. Add the coriander powder and around 1/2 cup of water or as required and bring to a boil. Add in the potato and garam masala powder and cover and cook for 5 minutes. Mash some of the potato with the back of the spoon to thicken the curry a bit. Add the salt and mix.